dance.net - Stunning Open Championship Dress (10247276) - Read article: Ballet, Jazz, Modern, Hip Hop, Tap, Irish, Disco, Twirling, Cheer: Photos, Chat, Games, Jobs, Events! Locked by Theresa (28613) on 2017-10-01 11:25:18 Sold! 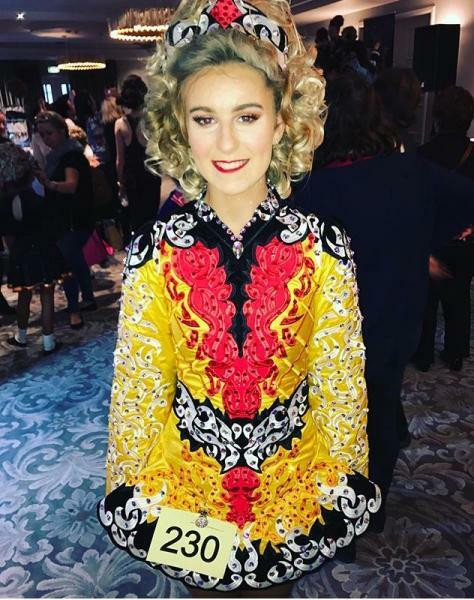 Stunning open championship dress made by Taylor Dresses Belfast for Worlds dancer. Worn by slim U16 dancer who is currently 164cm tall. In excellent condition. Covered in hundreds of genuine swarovski crystals this dress really sparkles and stands out on stage. Much admired this is a truly striking dress. Buyer will not be disappointed. Red kick pants and embroidered headpiece included. Back length from top of zip to hem 30 1/2. Never been altered but has room to let out/down. Available immediately. Happy to arrange try on where possible. Will ship worldwide and consider return for overseas buyer. Asking price Â£975ono plus p&p. Please contact me for further detailed information and pictures. Happy to answer any questions.